Many Western countries have banned smoking in bars and restaurants, but Austria is bucking that trend. Under a law passed in 2015, Austria was due to bring in a total ban this May, but now its new government of the conservatives and the far-right Freedom Party have scrapped the plans. The move was spearheaded by the leader of the Freedom Party, Austria's Vice Chancellor Heinz-Christian Strache, himself a smoker, who told parliament last month that it was about freedom of choice. He said restaurants should be free to decide if they want to have smoking sections, where "a citizen has the possibility to decide perhaps to enjoy a cigarette or a pipe or a cigar with their coffee". The move has horrified Austria's medical establishment. Dr Manfred Neuberger, professor emeritus at the Medical University of Vienna, says it is "a public health disaster". "The decision is irresponsible. It was a victory for the tobacco industry. The new government made Austria into the ashtray of Europe." Dr Neuberger says Austria already has "shamefully high" smoking rates among young people, "particularly compared to other high income countries". 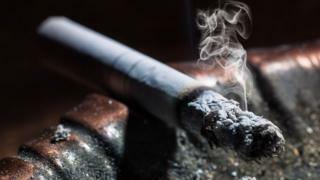 A survey of 26 countries by the Organisation for Economic Co-operation and Development (OECD) in 2013 said Austria had the highest smoking prevalence of children aged 15, a position it held since 1994. Now the Vienna Chamber of Physicians and Austrian Cancer Aid are launching a petition calling on the government to reconsider. Dr Thomas Szekeres, the head of the Austrian and Vienna Chamber of Physicians, says they "don't understand why the government wants to step back and allow smoking". How has smoking ban changed the UK? "We know smoking causes severe heart attacks, cancer and we know that in countries where smoking is not allowed in restaurants and bars, employees are protected and the whole population turned out to be healthier." Many of the famous cafes in the centre of Vienna have already gone smoke-free, partly in anticipation of the plans for a ban, and partly because of tourism. Large restaurants have to provide separate smoking and non-smoking areas - but the rules on keeping doors closed between the two spaces are widely ignored. Small establishments can choose to be smoking or smoke-free. At the Kleines Café, each marble-topped table has an ashtray and the air is blue with tobacco smoke. Peter Noever, one of the guests there, says Vienna has a habit of turning back the clock. "The Viennese believe that they are something super-special and smoking is a very strong part of culture. Image caption Peter Noever: "The Viennese believe that smoking... is a very strong part of culture"
"I was a heavy smoker, but I haven't smoked for 15 years or more. I smoked so much, I can't smoke any more. But I like smokers - they are more human." Peter Dobcak from the Vienna Chamber of Commerce says he is in favour of overturning the ban, although he admits there are splits among restaurant owners. "We have a lot of restaurants who prefer to let the guests smoke. "The higher level restaurant business is in favour of the ban. And the bars, the discos and the clubs are mostly in favour of smoking because the law forces people to smoke outside and then there is noise... late in the night." Café Hummel, in Vienna's bourgeois eighth district, went smoke-free one year ago. Its owner, Christina Hummel, says her business went down by about 5% after she banned cigarettes. But she says she is focusing on new, younger customers. "We see, on the positive side, that more families are coming to visit us for breakfast with their children. We have the big challenge to change our business concept." Opinions among her guests were mixed. Gerhard Lammerer, a non-smoking regular, said he was against the ban. "People will always smoke. Why don't we leave things the way they are? Why should we make things stricter and forbid it? In the past people smoked the strongest cigarettes until they were 90." "I think the smoking ban is the right thing," Christoph Riemekasten said. "The air is better. In other countries there's no problem with a smoking ban, just in Austria." Image caption Leo Lukas, a cabaret artist: "I'm absolutely pro-ban. The life quality is much better"
Leo Lukas, a cabaret artist, agreed. He says he can breathe. "I was a smoker myself for over 30 years, and still there are some nights when I am smoking. "But I'm absolutely pro-ban, because the life quality is much better - even in a traditional coffee house like this. I love it. It is really better."